As one of the first and last people a child interacts with during his or her school day, a school bus driver can send a kid off to class, and bring them back home, with a smile. 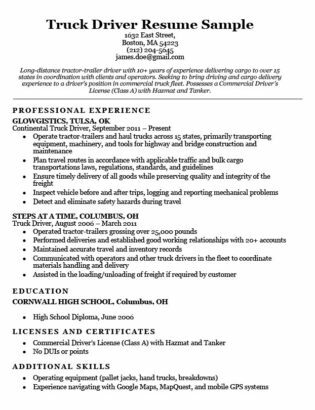 Check out our resume sample and writing tips to create an exceptional resume before you hop on board. Or, land that next interview with our free, easy to customize resume builder. 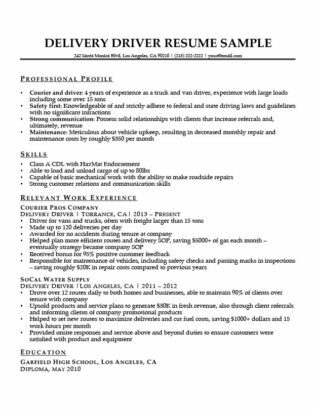 Trying to find a different resume altogether? Browse our complete list of resume samples. Dedicated and friendly school bus driver in the 4th largest school district in the country with 6+ years of experience operating full-sized commuter vehicles. Holds a Commercial Driver’s License (Class B with P & S endorsements), as well as First Aid and CPR medical certifications. Looking to continue a career that utilizes a skilled driving record and an affection for working with children. Follow these guidelines when writing your resume and you’re sure to make a strong impression. A standout resume objective is a simple way for you to ensure your resume gets sent straight to the top of any hiring manager’s stack. Lay out your personal attributes, what qualifications you bring to the table, and how you line up perfectly with the requirements of this position. An applicant for a school bus driver position will want to focus on a slightly different skill set than other professional driving jobs. Since your primary duties involve transporting our future generation across town, you’ll want to emphasize your A+ driving and safety record. Highlight your friendliness and any previous occupations that would demonstrate you have experience being around children in a professional capacity. Specify your Commercial Driver’s License classification as well as any additional certifications you might possess. Many hiring managers will help you with training and acquiring a CDL with the S endorsement, which is required by federal law. Any first aid or emergency medical training will also be an invaluable asset when applying. You’ve more than likely had previous professional driving experience if you’re applying for a position as a school bus driver. 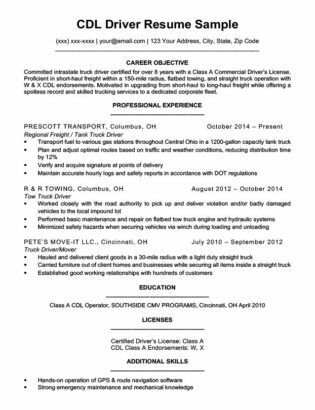 So, when drafting your resume, you’ll want to write in reverse-chronological format to show how you’ve worked your way up the ranks as a CDL-carrying professional. When recounting the various driver duties of your past jobs, quantify your achievements. Showcase how you increased on-time performance for a city bus route or lay out how many passengers you’ve transported before. This gives a potential employer a better understanding of actionable results you produced in your previous positions. …Quantify your achievements…this gives a potential employer a better understanding of actionable results you produced in your previous positions. Additionally, the safety and well-being of the communities’ children is your ultimate responsibility as a school bus driver, and hiring managers want applicants that are committed to that fact. This is an important first step in any commercial motor vehicle driver’s daily routine; inspecting defects with the bus frame, observing wear and tear on tires, and evaluating the operational safety of the school bus. Realizing this is a critical component in the transportation of young children will show any hiring manager that you recognize safety is key. As with vehicle inspections, this is another crucial aspect of the mass transit field. Before you begin any bus route, you’ll need to run down an operating systems checklist – inspecting and logging any problems you find with the basic systems of the school bus. It’s illegal to operate a commercial motor vehicle without functioning windshield wipers, emergency lights, or…brakes, and it’s also highly unsafe! Demonstrate that you’re familiar with systems reports for school buses and let your prospective employer understand that you know what is expected of you. Not everything is going to go according to plan during your route. Perhaps a kid slips and scratches up his or her knee while attempting to board the school bus; you’ll need to know how to administer first aid. Other days, you might be presented with a real emergency and a hiring manager will want to know if you can take charge, stay calm, and guarantee the safety of the kids on your school bus. School Bus Driver qualifications have an extra level of scrutiny attached to them due to the precious cargo they transport on a daily basis. They must currently possess, at minimum, a Class B Commercial Driver’s License and, in order to earn the specialized S (School) endorsement, they must already have earned the P (Passenger) endorsement. In addition to the federal regulations set forth by the Federal Motor Carrier Safety Administration (FMCSA), every state has its own standards and regulations. Check your local DMV for details on what is required to legally operate a school bus. Showcase strong interpersonal, communication, and navigational skills in lieu of any technical knowhow. In addition to any relevant medical certifications, also highlight any knowledge of basic bus maintenance or specialized equipment for disabled persons. This will demonstrate to your employer that you have the potential to solve a mechanical problem in case of a breakdown, as well as increase your availability as a possible school bus driver on routes with children that require an extra level of care and attention. So, are you ready to begin your career driving that famous yellow bus? Personalize your own resume with our free builder and pull out all the stops.